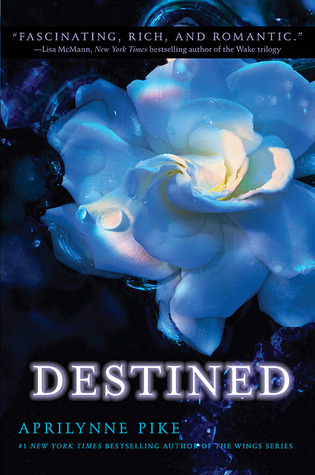 Destined (Wings #4) by Aprilynne Pike. Publication : May 1st 2012 by HarperCollins. Wow. Without a doubt, Destined is the best book in the series by far. Everything comes boiling down to a final battle and it is epic. So many things happen in this book that it's going to be really hard for me to keep the review spoiler free (but don't worry, I'll manage). If you remember, Illusions ended with a major cliffhanger and it was pure torture not knowing what was going to happen next. Destined picks up right after Illusions and turns out, the fight for Avalon is just beginning. Laurel and Tamani, accompanied by Chelsea and David, rush to Avalon to warn the faeries of the war that's coming. With the future of Avalon and all their lives at stake, there's no room for mistakes. If you've followed Laurel, Tamani, David and Chelsea right from the beginning and like me, find it hard to say goodbye, don't worry, Aprilynne Pike has done an amazing job with the final book, leaving nothing unanswered. Destined is fact-paced, dramatic, exciting, action-packed and ties up all loose ends. With so many twists and turns, I thought I had seen everything the book had to offer but I couldn't have been more wrong. There're some characters that will shock you while others that still manage to surprise you. I stayed up the entire night reading Destined and the whole time, my heart beat was way too fast. Destined is a gripping, intense and bittersweet conclusion to the series. As for the romance, Aprilynne doesn't let down - heart-fluttering and sometimes, gut-wrenching, the book left me in tears. Emotional, happy tears. I've loved the magic of Avalon right from the beginning. Wings is one of the most enchanting, charming series out there and unlike a lot of fantasy books, the author has ended the series in the most beautiful and satisfactory way. It doesn't matter whether you're on Team Tamani or David, huge things happen to both of them in this book. Laurel finally understands and puts her Fall magic to use and Chelsea plays a huge part as well. I'm not kidding when I say that I was on an emotional roller-coaster while reading Destined. Depending on your point of view, the end will leave you feeling blissful or devastated. Personally, I fall under the former. While it's insanely difficult for me to say goodbye to the series, there's nothing I'd want different about Destined - it's the perfect ending. Whether you've followed the books right from the start or you're new to them, Wings is a wonderful series that I recommend to every reader out there. OOHH I am reading it right now. So far it is action packed and emotions are running high!! Glad you think it is the best one yet! !